Withdraw two weeks prior to the start of camp/clinic/lesson/club play: A full refund will be provided (less $20.00 administration fee). Withdraw within two weeks of the start of camp/clinic/club play: 50% of the registration fees will be refunded (less $20.00 admin fee). Note: Should a replacement athlete be available a full refund will be provided (less the admin. fee). Withdraw within 24 hours of a scheduled private/group lesson: no refunds will be provided. Once the camp/clinic/lesson/club play has started no refunds will be provided. No refunds are provided to club volleyball athletes. However, participants of Pinellas Heat camps/clinics/lessons who have to withdraw from the camp/clinic/lesson due to personal injury may receive a pro-rated refund. 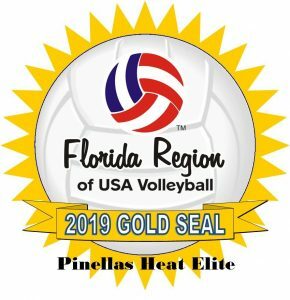 These requests must be made in writing and forwarded to Pinellas Heat Elite Volleyball Club, Inc., 1490 Belcher Road, N, Suite E, Clearwater, FL 33765. CLUB VOLLEYBALL ATHLETES/PARENTS: Pinellas Heat does not offer any refunds for club volleyball athletes since the loss of an athlete cannot be easily replaced once all club athletes have committed to their teams. Therefore, Pinellas Heat defines the start of the season as the team’s first practice and not the team’s first tournament. However, should an athlete become injured and not be available to continue her season, Pinellas Heat will not pursue the remainder of any amounts due. Still, any request for waiving of fees due to injury must be made in writing to: Pinellas Heat Elite Volleyball Club, Inc., 1490 Belcher Road, N, Suite E, Clearwater, FL 33765. We are a member club of the Florida Region of USA Volleyball. As a player you may stop any unwanted contact from a club representative by simply asking (either verbally or in writing) that all contact cease. Any player believing a club representative of any Florida Region volleyball club has been intimidating, harassing, or acted inappropriately in any manner of contact or recruiting should contact the Florida Region office at (352) 742-0080. Direct distribution includes but is not limited to; mailings to specific players or parents or hand distribution to players and parents. 10 years later, how Penn State volleyball lost only two sets in 2008 and won a national championship.